There was really nothing that could hold back that last punch from a northern Arctic blast. It was powerful enough to push its way this far south (and farther) and hang around for a while. That spell of cold, wintery air translated to 11 straight days of temps under 60 degrees. The closest thing to that record was over 50 years ago, in 1956, when that happened for 7 straight days. Is there anything really that has more say-so than Mother Nature when it comes to the elements that affect our gardens! And no matter the efforts made to combat those elements, there isn't a thing we can do about most of them. Despite all the efforts and positive thoughts and energy directed toward the most favorable outcome ... the results of the record-breaking January days are pretty bleak at Hoe and Shovel. With two mornings dipping down to 26 and 27 degrees for a few hours really it’s a wonder every single plant didn’t gasp its last green breath. I’ll spare you the whining. AND the parade of pitiful plant photos. There are many. Pitiful plants, that is. Oh, I feel like whining. Believe me. But it absolutely won’t change a thing so no indulging tolerated where whining is concerned. I do love “my Florida” regardless of the risks our weather conditions bring with winter’s fickle season. It is getting back to normal around here and that means full days of abundant sunshine and clear blue skies along with typically mild temperatures. Even a couple of lonely butterflies added some much needed color to the garden in the soft sunlight as it warmed up today. Leisure time in the garden is in order while we chomp at the bit for a few weeks ready to start pruning away all the damage. Well, maybe not exactly leisure ... but for the rest of this week anyway we'll take a break from the usual duties. 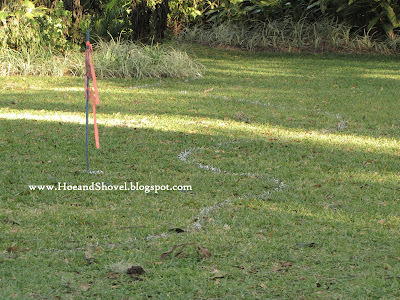 Marking off another large area of lawn with visions for a mostly naturalistic planting. 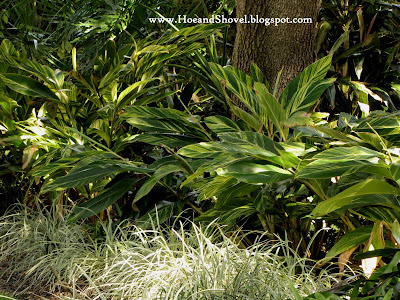 A project slated to start next week will keep me busy while waiting to cut back the winter-ravaged plants. Meanwhile, along with my best helper and garden enthusiast, we packed up our lunch, tossed a blanket on the grass in the shade and ate our lunch outside today. Our entertainment mostly from the flurry of birdie activity. 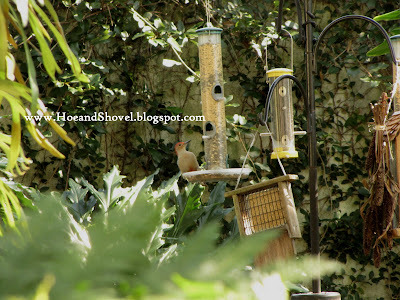 So much going on at the feeders, in the trees and even on the ground where the robins have been flocking for the berries they drop out of the camphor trees. And, of course, entertainment from the wee one’s fascination with every stick, rock, bucket, shovel, dirt, water, bird bath and anything else his adventurous mind can find to pile, dig, collect, kick, throw, touch, handle and generally let his wondrous imagination run wild with. It was a beautiful day regardless of the condition of the garden. This winter so far has been challenging like none other in recent memory. But as sure as winter’s fury has visited so spring will soon come. I bet it is difficult for you to complain when your Sister lives in a deep freeze. ;) Your garden will survive. I like to think of these set backs as opportunities. After I get over the shock of course. What with that good garden help you can carry on. I even think you get to whine a little. Meems, I had been wondering how you and your gardens fared. I feared the worst for all your tropical plants.Here's hoping the damage won't go too deep. Your project sounds interesting. Keep us updated. :) And of course your helper will be invaluable! Your gardens still look gorgeous Meems. The artic blast sure made my gardens look like I live further north than I do. 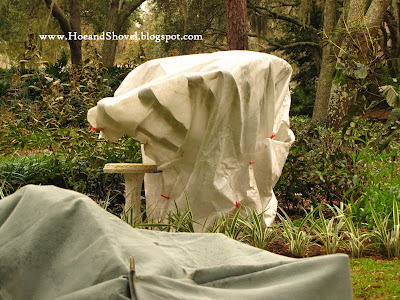 All in all, it will make for a very interesting gardening season..love your curious gardening helper! Hi Meems, I'm new to the blogging world and have loved seeing your garden which is in my same zone 9. I will be regrouping in my own garden and can't wait to see what you do in yours. I love the way you have your lush design and am using your photos as inspiration. I understand not wanting to dwell on the sad looking foliage, but would you mind sharing what plants did well with the cold? I'm looking to put more "bones" to my garden plan this year. Thanks for such a beautiful blog! I'm sorry for the difficult weather you've had. I kept watching the weather reports on tv and worried that your beautiful garden was being frosted upon. It will bounce back soon, I hope. I can imagine the mushed plants and how sad it makes you feel. I hope new projects, sun filled warmer days and your adorable helper make it better. gail ps It is so okay to whine! Here's hoping that Spring starts on time around here. What, about a month? I've thought of you and your gardens frequently. This has been quite the winter. If it weren't for the birds (especially the painted bunting that surprisingly didn't leave) and winter grass, brown would be our only color. Trying not to whine, as well. The pruning will be good therapy in the weeks to come. Meems, these pictures are so cheerful and fun. But wait, I think I see an intact, colorful CROTON in one of those photos!!! My crotons are all fried! Ugh! I think I remember that you live in a coastal locale. (?) I know my plants will all be back, though. 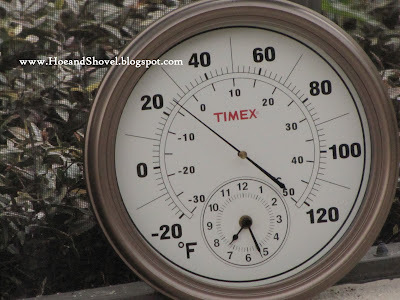 We actually had a 25-degree day last year in my garden that did far more damage than these successive freezes, in which it only reached 26 degrees here. (I can't believe I said "only." It's just that all the hype made me fear far worse.) For some reason, my neighborhood's 2009 freak freeze didn't make the news...probably because all other surrounding towns were untouched. It really irritated me last year when I drove to towns 30 miles NORTH of here, and their bougies and tibouchinas and crotons were all still huge and beautiful. So, anyway, this is my SECOND experience with a hard freeze in just two years. Winter isn't so bad when it comes a single night at a time. When it comes and stays, it's brutal. We were really hit this time. The only bright spot in my garden besides the violas is the winter ryegrass: green as uh, grass. I'm grateful for a few days of warmth. LOTS of opportunities I'm looking at right now. Thanks for the encouragement... and yes, my little garden helper keeps me focused on the most important things in life. I'm pretty sure everything survived only it won't actually look like they did for a while. Fortunately we warm up here very quickly so our growth will start as soon as I'm brave enough to cut back. When it gets this cold here we KNOW it is VERY cold in all of the south because you get it first and harder. So often it misses us or just misses us. This time it made it to Miami. That's powerful. A fire sounds nice, too. You DO live lots further north than I do when it comes to these spells. Believe me. You might as well be in Alabama. No. Not looking gorgeous around here. Believe me again. Welcome to Florida blogging. I had every intention last year of listing which plants survived the cold with honor but never got around to it. I will do my best to make a list or a post or something to indicate which plants did better than others. Only it won't mean any of it is set in stone. There are SO MANY microclimates in Florida we might as well throw the zone chart out the window. I look forward to visiting you when I get a couple of extra minutes. Hey! So glad to see you here. Spring will be here before we can blink. It is my goal to get some projects done before the heat and humidity settle in. Love this weather for being in the garden. The normally cheerful and lush view from my kitchen window is a wash in browns of all shades. The birds are the color of the garden right now. Yes, therapy... it's all going to be good... eventually. Thanks, dear friend, for thinking of me. Well, I'm trying to stay that way. LOL in spite of the disappointments. The crotons somehow made it. I have NO idea why~~ last year with higher temps and less frosty nights they were fried to a crisp. I'm wondering if the cold air consistently might have hardened them off... like I say... the pockets of micro-climates sometimes are unexplainable. We were so surprised when we drove through the middle of the state last year in January and saw worse damage than we experienced. It was very odd. You're trimming your crinums? Brave girl. I'm trimming my impatiens because I don't care if they freeze again... I don't care if they never come back. 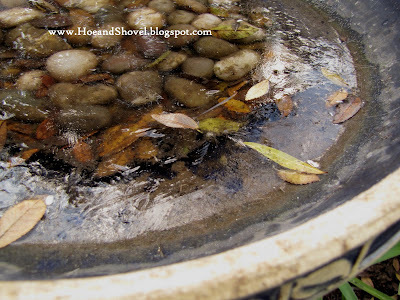 BUT if we manage to get of winter without another freeze ~~ they will be really pretty in a few short weeks. And I'll let them do what they do. I guess everyone was hit quite hard this year. Mother Nature was kind of relentless at the start of this new decade. It will be very interesting to see how the rest of the year goes. Gotta love the violas ~~ although mine were a container and will need a couple of weeks of recovery to look great again. Hi Meems, So sorry to hear about your bad weather and damage. Hopefully all of your 'pretties' will come back!!!! Plants can be pretty resilient you know. Thanks for the update. Hopefuly, the worst of the winter weather is over for ALL of us. Did the cold weather scare about the Armadillos??? I hope so. i am so glad we are all getting a reprive from the very, very cold weather. it feels so much better today that i have opened some windows to air things out and the sun is shining, always a plus. your gardens are still so beautiful but i know it is such a hard thing to have harsh weather mess things up. isn't it great to have your little helper around to help lighten the mood and load. lol! i sure hope it is the end of the bitter cold weather. Meem: This is the first time I have ever left a comment to you even I have been reading your blog for quite a while now. I have to say your garden is one of my inspiration which triggers me to put more efforts into my nearly bare garden. I just opened my first ever blog to record my garden evolement. 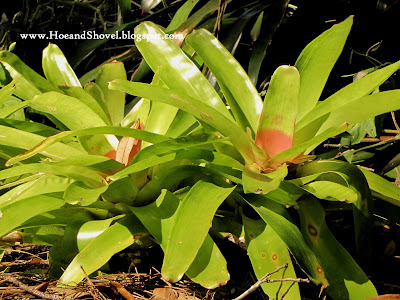 Here is the URL: http://sefloridagardenevolvement.blogspot.com. 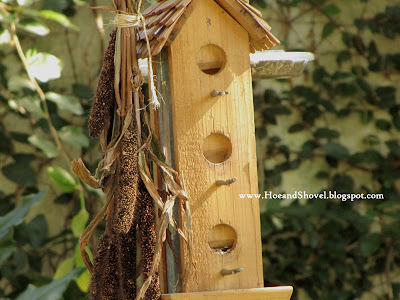 You can tell I still have a lots to learn, both blog and gardening! Your new project really interests me, I am sure I will follow your progress through your blog. Thanks again for the influence your blog had on me even you probably did not realize it! 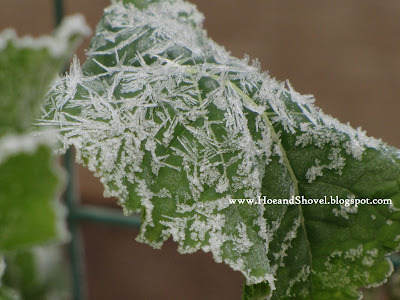 Sorry to hear the freeze caused your garden so much damage. I think lots of folks are in the same boat here in Florida. My poor soil [sand] here actually turned out to save most of my plants. 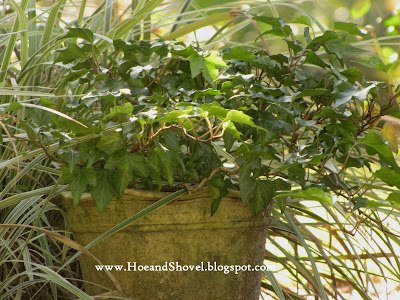 Most I have been growing in containers because of the soil and because of that was able to bring most them inside. I feel so badly for you, Meems, with all the extreme cold you have had in your garden. I hope most of the plants will survive and that you don't have too much damage. But you have a wonderful attitude--as you say, Mother Nature can't be defeated, and this may give you a chance to do some new plantings. I'm sure your cute little gardener will be eager to help. Hi Meems, I'm sorry that some of your plants got hurt. Your garden is still so lovely. Mine all bit the dust. I was sick so nothing got covered up. Will just have to wait till Spring to see if I have anything left. This has been an awful winter. Snow & ice below Daytona Beach so I was informed. I hope your garden perks up soon. Meems, I like your positive approach! 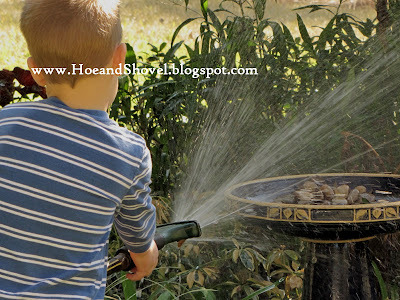 I also love your photos...the little one with the hose is too sweet! I must admit that although I've done my share of whining, I'm so happy to wear open toed shoes again!!! PS I just saw that you and Marmee are going to Buffalo~~ I am so excited. Yippee! You are going to have a marvelous time. Have you met Kylee's mother! We caught one more armadillo and it was on one of those first cold nights. There are more out there... the trap stays set all the time. so glad for you to have a break in the cold. Open windows and doors... ahh... love the fresh air. My little guy is not understanding why the cold air would do such damamge to the garden. Congratulations on starting your very own blog. I think you will enjoy journaling your progress as your garden evolves. Thank you for visiting, reading, and for leaving such a sweet comment. I brought in loads of pots but couldn't move some of the heavier ones. This is first time EVER that I actually covered some of my container plants. Some froze anyway. new plantings. I'm getting started on the container plants... many of them need the perennials pulled out and transplanted to the ground... this is giving me the impetus to get it done. I'm so glad you've started a blog! I'll check it out soon. I'm starting with the impatiens... it is risky to start cutting back now ... if there is another freeze there will be worse damage and you could lose the entire plant. If there isn't another frost or freeze for the rest of the season you will be way ahead of the game if you cut back now. I'm going to try to hold off for a few weeks. There are plenty of other things I can be doing in the meantime. I'm sorry to hear you were sick. Being sick is much worse than losing some silly ole plants. I hope you are much better now. Covering didn't help too much with such a dip in the thermometer. We don't keep our toes in shoes for very long in Florida do we! You go ahead and whine, I really don't mind... I've done my share in the past... just learning a little more how to embrace the unexpected. There has to be something good come from this... I just know it. So good to see you. Stuck in for a week would be so strange. Happy New Year to you, too. Only met Kylee... not her mom ...but look forward to it. We are so excited Buffalo comes at what looks like a good time of year for both of us. We have our reservations and are very excited to be there and meet everyone. Woo-hoo! Well I don't care how bad your garden was hit, it looks beautiful to me especially the shell gingers. Maybe someday I'll have a little garden helper of my own... you must be very proud. I live in the Ft. Lauderdale area and have been ever so proud of my butterfly garden in my back yard since last spring. While there is some damage, I think most plants will put out new growth and survive. The worst damage is on my lipstick plant, but I see buds on it. Every tree and bush has dead leaves, and my beautiful pea vine has lots of shriveled leaves. I can't wait until they all come back full force. As for butterflies - we only saw 2 today - one monarch and one gulf fritillary. We usually have dozens of butterflies all day long - I'm afraid they took a big hit, too - and THAT bothers me more than the bushes and flowers that wilted. Oh Meems, I feel your pain. I'm sure it's even worse to have the cold weather when you're not used to it. We expect it here (doesn't mean we like it) but your part of the country is usually the warmest this time of year. I hope you don't lose too many precious plants. Glad it is warming up too. So glad you're on the upside of it. Happy gardening with that new project! So sorry about that cold. Send it back up north where it belongs. Love your little helper. Most of the shell gingers fared okay through the cold... probably because they are tucked underneath the oaks. The more exposed they were the more they were bitten. I couldn't be without my little helper. Thanks for stopping by. I know exactly how you feel. 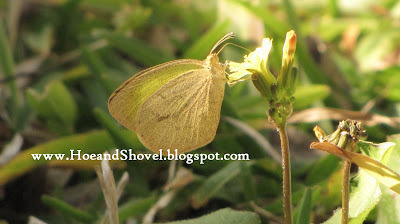 I have seen scant numbers of butterflies compared to what we typically see this time of year. When I do see them they are desperately seeking nectar. There aren't any flowers left. 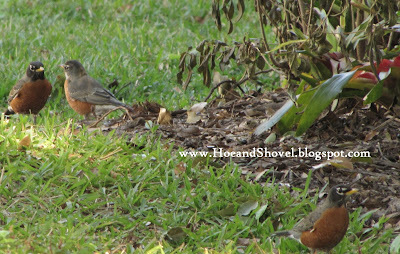 Between my neighbor and I they usually flit back and forth with plenty to keep them nourished. I'm working on some container plants with new flowers for them. The little fellow definitely keeps life in perspective. It means a lot of extra work but most of the landscaping will come back... eventually anyway and we can live with that looking ahead to spring. The hardest part now is leaving all that dead until it is safe to prune. I'm getting antsy about it. With our current mid-70's weather and sunshine it's hard to imagine it could get that cold again. Oh, we tried to send it back... it came with determination didn't it! 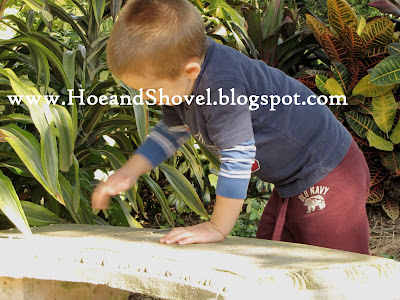 My little helper keeps us on our toes...and LOVES being in the garden with us. Good to see you, Layanee... stay warm. I jes' hate to think of the devastation in yore luvely garden, chile'! I seen a show on History Channel about the Little Ice Age an how in some parts it snowed in the summer--caused famine over Europe an sent New Englanders packed in Prairie Wagons westward. Fer us'uns in Florida it felt like our own ice age. I has umbrella of dead sticks whar' I once had a lush terra cotta colored bougainvillea, leaves still droppin' from plumbago...we look like we's been nuked. Hardest thang of all is to resist prunin' too soon. But I think it gives some time to rethink the landscape. And come spring, the lush beauty of a Central Florida landscape will be all the more precious to us. Alwys fun to peek in yore yard.